Originally posted because of the film's availability via the Criterion Channel on Filmstruck, you can now read about the April 2017 Criterion Blu-ray here. The review below was originally written for DVDTalk.com in 2010. Buena Vista Social Club was quite the phenomenon back in the late 1990s. 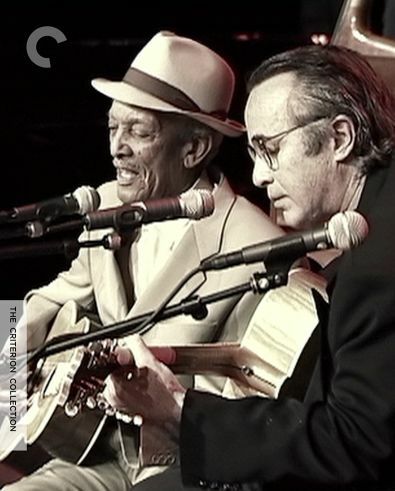 It started as a Grammy Award-winning album put together by Ry Cooder, and then it was followed by an Oscar-nominated documentary by German director Wim Wenders. The endeavor began with Cooder traveling to Cuba in search of the origins of some music he had heard on a tape some time prior. In trying to bring together different people, he discovered a large group of nearly forgotten musicians and singers, all of them well into old age, who represented the country's lost musical past. 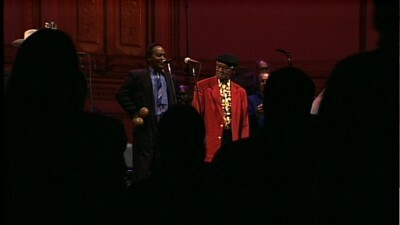 The film was made to spotlight the personalities behind the music, as well as to document a gathering of the participating musicians for a concert at Carnegie Hall. The resulting public embracing of this particular type of music is something I think only comparable to the similar celebration of T-Bone Burnett's archival soundtrack for O Brother, Where Art Thou?. 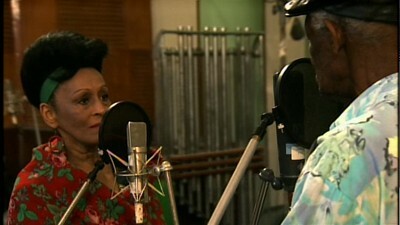 Wenders, shooting on video, put together Buena Vista Social Club using interlocking footage from a variety of parallel tracks. He followed Cooder around Cuba, peeking into the recording studio and breaking off to interview some of the musicians. He tours their neighborhoods, capturing on-the-street glimpses of modern Cuban life, laying the artists' stories on top of the images. Each of the interviewees talks about how they got into music, establishing a common history: just about every one of them picked up an instrument as youngsters, usually as part of some family tradition. This led them to embrace well-known songs, as well as collaborative efforts to create new ones. Wenders cuts together impromptu performances and a cappella versions with bits from the studio and full-band efforts on stage. Most of the performers also talk about their instruments and how some of them are specific to Cuba. For me, hearing the old stories is more fascinating than the music itself. I liked the songs, but actually wish they had either been put more front and center or they were more constant. Songs softly mixed in with the interviews would have created a real rhythm for the entire movie. That's a small complaint, though. There are some great tales about the fighting techniques of blind piano players, busking on the street, or the men bragging about their virility and the number of children they have (at 90, Compay Segundo has five kids and claims to be working on his sixth). One of my favorite sequences was seeing Rubén González play piano for a bunch of young ballerinas. The joy of music really came clear watching the little girls break form and just move according to how the sounds made them feel. It's also neat seeing these old guys go to New York for the first time. They have a sense of wonder that is rare these days. Sadly, many of the musicians in this film have died in the decade-plus since Buena Vista Social Club was released. Segundo, González, Pio Leyva, Manuel "Puntillita" Licea, Anga Diaz, Orlando "Cachaito" López, and Ibrahim Ferrer have all passed on. Buena Vista Social Club was the right document at the right time, a chance for these talented individuals to take one more shot at sharing their gift with others. The movie could take on a melancholy air as a result of this. There is even one shot where González is looking for the Statue of Liberty, and he nonchalantly points past the World Trade Center. So much has changed since that night at Carnegie Hall, it would be easy to get wistful. Yet, the fire of the music remains, and as Ibrahim's final song in the movie suggests, it can't be extinguished.